Betsy Devos’ confirmation hearing showed she’s either underprepared or a zealot. Donald Trump’s pick for secretary of education tried to sound like a moderate—and revealed that she’s either underprepared or a zealot. Betsy DeVos, President-elect Donald Trump’s pick to be the secretary of education, testifies during her confirmation hearing on Tuesday in Washington. 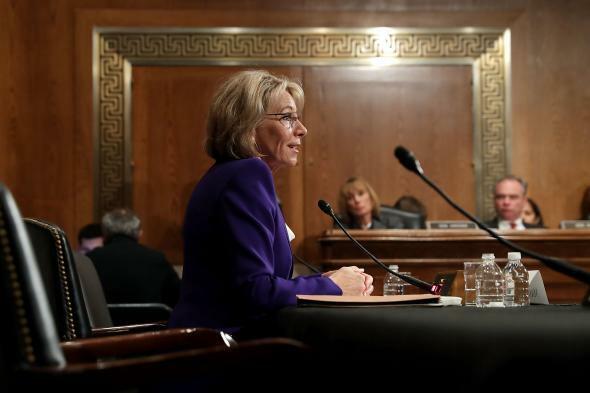 President-elect Donald Trump’s nominee for secretary of education, school-choice philanthropist and Republican donor Betsy DeVos, faced a starkly divided panel of senators at her confirmation hearing Tuesday night. Republicans lauded DeVos’ advocacy on behalf of school choice. Democrats, meanwhile, pressed DeVos, a billionaire, to release three years of tax returns and provide more detailed ethical disclosures. DeVos was exceedingly polite and made efforts to present herself as moderate. In her opening statement, she praised public school teachers and tipped her hat toward the Department of Education’s role as a protector of students’ civil rights. But in several instances—such as when she said the treatment of disabled children was “an issue best left to the states,” despite the fact that federal law contains strict regulations on accommodating disability—she revealed herself to be either underprepared for the job or stiffly wedded to an ideological, market-oriented vision of education policy, one that has had disappointing results in her home state of Michigan, where she wields enormous influence. DeVos’ allies, like former Sen. Joe Lieberman, who introduced her, presented her lack of governing experience as a plus. Coming from outside the educational “establishment … is one of the most important qualifications you can have for this job,” Lieberman said. As expected, DeVos pushed her passion project: giving low-income students taxpayer-funded vouchers to attend private and religious schools, a strategy that has demonstrated few gains in terms of student achievement. “Why, in 2017, are we still questioning parents’ ability to exercise educational choice for their children?” she asked. “For me it’s simple: I trust parents and I believe in our children.” She spoke glowingly of the Acton Academy, a national network of tuition-charging private schools, and the Potter’s House School, a pair of private Christian schools in Michigan that charge tuition on a sliding scale, with a minimum family contribution of $600 annually. Little was said about specific successful, traditional public schools. Here are some of the hearing’s flashpoints, from a fiery exchange with Vermont Sen. Bernie Sanders to the elements of the Obama agenda that DeVos indicated could be rolled back. Child care and pre-K: These are newer issues for DeVos—and it showed. Sanders asked DeVos how she would help make child care affordable for a single mother earning $40,000 per year. DeVos was basically unwilling to discuss child care. “I would look forward to working with you,” she said, “to ensure that young mom’s child will have a great opportunity for a great education in our future.” Either DeVos is not familiar with the Ivanka Trump child care proposal or she sees it as outside her potential purview as secretary of education. That could be shortsighted, since the academic achievement gap begins in infancy, not in pre-K or kindergarten. On pre-K, DeVos praised state programs in Florida and Georgia for allowing private schools to participate. (Not mentioned: Mayor Bill de Blasio’s universal preschool program in liberal New York City, which works much the same way.) She also echoed a frequent talking point of House Speaker Paul Ryan: Referring to Head Start, the only federal pre-K program, DeVos mentioned exploring ways to “more effectively use those monies”—a phrase that is sometimes coded language for cutting funding to the program. Campus sexual assault: In an exchange with Sen. Bob Casey, a Pennsylvania Democrat, DeVos said it would be “premature” for her to commit to enforcing the Obama administration’s 2011 regulations, which require colleges to investigate claims of sexual assault more aggressively. She said the rights of both victims and the accused must be protected. This is a big debate within education reform. Making an active choice may feel satisfying. But sadly, research shows that in choice-driven public school systems like the one in New Orleans, many parents do not select schools that maximize their children’s learning. Online learning: Lots of Trump voters live in rural areas, but it’s hard to provide school choice in low-density regions; there simply aren’t enough “consumers” to create a true educational market of charter schools, magnet schools, and the like. As expected, DeVos suggested to the Republican senator from Wyoming, Mike Enzi, that “distance learning”—online courses—could be a solution to that problem. DeVos and her husband have owned shares in K12 Inc., a for-profit company that runs online charter schools. Guns in schools: “I think that’s best left for localities and states to decide,” DeVos said. When Connecticut Sen. Chris Murphy, a Democrat, asked if she would support Trump’s proposal to ban gun-free school zones, DeVos said she would back the president if he decided to pursue such a policy. She also mentioned a Wyoming school she heard about from Enzi, where “I would imagine there is probably a gun in the school to protect from potential grizzlies,” she said. The fine points of policy: Policymakers and educators often debate whether schools ought to be judged on “proficiency” or “growth.” No Child Left Behind, infamously, was based on proficiency, requiring all children to reach specific standardized test scores. Newer federal and state laws tend to focus on “growth,” meaning schools are not necessarily penalized for below-average test scores as long as individual students are steadily improving over time. In an exchange with Sen. Al Franken of Minnesota, DeVos seemed unfamiliar with the distinction between the two terms. “It surprises me you don’t know this issue,” Franken said. He argued this was the reason the Senate needed more time to review DeVos’ experience and her finances—senators only had five minutes each to question DeVos at the hearing, which took place before DeVos had completed paperwork from the Office of Government Ethics. However, Sen. Lamar Alexander of Tennessee, the chairman of the Health, Education, and Labor Committee, declined to hold a longer hearing or a second hearing and instead said members could submit further questions in writing. It’s a safe bet that the Democrats on the body still have a bunch they’d like answered.